The Kielder osprey breeding season is now well underway with a total of 13 eggs currently being incubated in four nests. The first egg appeared on Monday 10 April in the nest known as 1A and laying was completed on Sunday 30 April on Nest 3. The females on Nests, 2, 3 and 4 are all sitting on three eggs, while the fecund female on 1A has laid four eggs for the second year running. For the same female to lay four eggs in consecutive years could be a UK first. Last year, the ospreys had a record-breaking season laying a total of 12 eggs and fledging 11 chicks. This year has the potential to be even better although the success of the season will depend on how well the birds incubate the eggs during this extremely changeable weather. Visitors can watch the antics of the birds on three of the nests through nest cameras broadcasting at Kielder Castle Café. For a chance to see these magnificent birds, join Northumberland Wildlife Trust volunteers at Northumbrian Water’s Kielder Waterside every Saturday, Sunday and Monday to view Nest 1A and 2 through a scope and see live footage broadcast from the nest to a screen in the cabin. 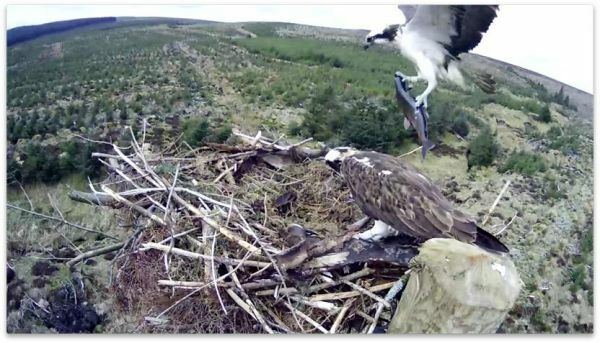 Kielder Osprey Watch is a partnership between Kielder Water & Forest Park Development Trust, Forestry Commission, RSPB, Northumberland Wildlife Trust, Northumbrian Water and Calvert Trust Kielder. The partners are working hard to ensure that the ospreys are here to stay by maintaining a high quality habitat in Kielder Water & Forest Park and safeguarding and monitoring the nest sites. To find out more, go to www.visitkielder.com.